The Scottish Vocational Qualification (SVQ) in Laboratory and Associated Technical Activities (Education Science) at SCQF level 7 allows candidates to demonstrate competence in job related skills in their particular area of work and expertise. The qualification covers areas such as health and safety, working relationships, and evaluating and providing scientific or technical assistance for learning activities. This qualification has been designed in partnership with Cogent Skills to ensure relevance to the sector. This qualification is available through colleges, employers, and training providers. Upon successful completion, learners will gain an internationally-recognised qualification which guarantees that they have the skills, knowledge and abilities required to carry out their role successfully. Employers will also benefit from their employees being proficient. The level 7 award could provide progression to a range of science qualifications. Assessors and verifiers must be able to meet SQA’s general requirements for technical/occupational competence as outlined in the Systems and Qualification Approval Guide (510 KB). The specific delivery requirements are set out in the Assessment Strategy. The SVQ in Laboratory and Associated Technical Activities (Education Science) at SCQF level 7 consists of 3 mandatory units and 5 optional units. For details of the units making up the SVQ, please refer to the qualification structure (68 KB). 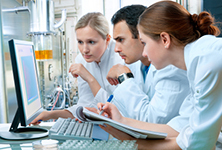 This SVQ is a mandatory component in the Level 3 Modern Apprenticeship in Life Science and Related Science Industries. This qualification is now in its lapsing period and will finish on 31 December 2022. This qualification is also part of Life Science L3.